Looking for an elite dining experience in Melbourne? Look no further than Crown. 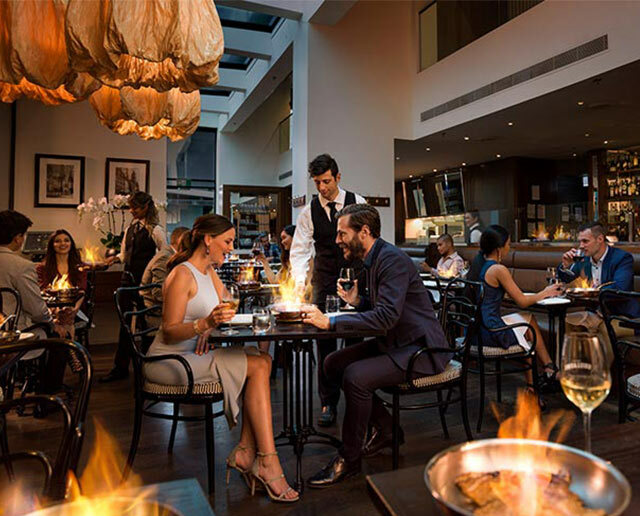 With restaurants like The Atlantic, Conservatory, Rockpool, Nobu, Dinner by Heston Blumenthal and more, Crown Melbourne restaurants offer fine dining at its finest along the Southbank Riverwalk. Inspired by France's most popular neighbourhood bistros, Bistro Guillaume Melbourne elevates the dining experience for a modern international audience. The Conservatory restaurant offers an array of international cuisine, with a series of different culinary stations, each offering a unique dining experience. Dinner by Heston Blumenthal offers diners a very modern interpretation of historic British gastronomy. Experience the serene ambience created by internationally renowned designer Tony Chi midst the tranquil surrounds of a Japanese water garden. Celebrated Australian-born chef David Thompson's Long Chim restaurant and bar is located conveniently along the Riverwalk at Crown Melbourne. Crown Metropol proudly presents Mr. Hive Kitchen & Bar - our signature restaurant offers diners Australian inspired modern dishes. The world’s most recognised Japanese restaurant Nobu Melbourne is known for its delicious and innovative new-style Japanese cuisine. Offering an unparalleled selection of oysters from Australia’s premium growing regions the Oyster Bar & Grill is the perfect place for celebratory drinks and delicious dining. Beef is the showcase at Neil Perry’s award-winning restaurant. Rockpool Bar & Grill Melbourne is so much more than a steakhouse. Experience the art of Chinese cuisine at renowned Melbourne restaurant Silks, as our expert chefs take you on a journey of discovery based on excellent food, impeccable service, and an elegant atmosphere. The Atlantic restaurant on Melbourne's Southbank delivers the ultimate dining experience showcasing seafood in its purest form. The Waiting Room Melbourne is the ultimate place to experience a selection of small dining offerings in majestic surrounds. Rosetta Ristorante Melbourne offers a sophisticated Italian dining experience, with a seasonally driven menu of Neil Perry's favourite regional Italian recipes. Spice Temple Melbourne, created by Neil Perry, is a modern Chinese restaurant that specialises in regional cuisine. A truly creative mind that questions everything we take for commonplace, Heston Blumenthal has simply changed the way we approach and understand food and dining. With an obsessive commitment to research and creativity, Dinner’s Chef Director Ashley Palmer-Watts has worked alongside Heston for just under 20 years. After months of intense competition, Kelly has been named Australia’s top executive chef in the inaugural Executive Chef of the Year 2016 competition. David Thompson is known for his love of Thai food and culture, taking inspiration from the streets of Bangkok and the flavour and energy of Thailand. Neil Perry is one of the leading and most influential chefs in Australia. A down-to-earth approach and passion for working with great produce, Zac joined the kitchen team at Rockpool Bar & Grill Melbourne in 2008. At Emporio Pizza and Pasta, our chefs will prepare delicious pasta, wood-fired pizzas, steak and seafood in an Italian inspired, open kitchen. Enjoy some of Long Chim’s classic canapes and snacks, while learning how to make two of the venue’s signature cocktails. $80 per person. Conditions Apply.